Would you like to have your own spacecraft in space? I’m Zac Manchester KD2BHC, a graduate student in Aerospace Engineering at Cornell University. 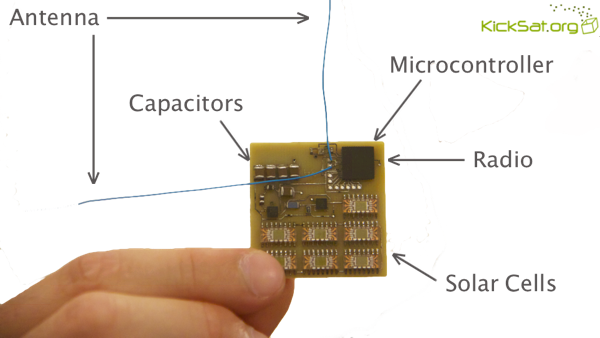 Over the last several years a few collaborators and I have designed, built, and tested a very tiny and inexpensive spacecraft called Sprite that can be built and launched into low Earth orbit for just a few hundred dollars each! My goal is to bring down the huge cost of spaceflight, allowing anyone from a curious high school student or basement tinkerer to a professional scientist to explore what has until now been the exclusive realm of governments and large companies. By shrinking the spacecraft, we can fit more into a single launch slot and split the costs many ways. I want to make it easy enough and affordable enough for anyone to explore space. Sprites are the size of a couple of postage stamps but have solar cells, a radio transceiver, and a microcontroller (tiny computer) with memory and sensors – many of the capabilities a bigger spacecraft would have, just scaled down. This first version can’t do much more than transmit its name and a few bits of data – think of it as a shrunken down Sputnik – but future versions could include any type of sensor that will fit, from thermometers to cameras. 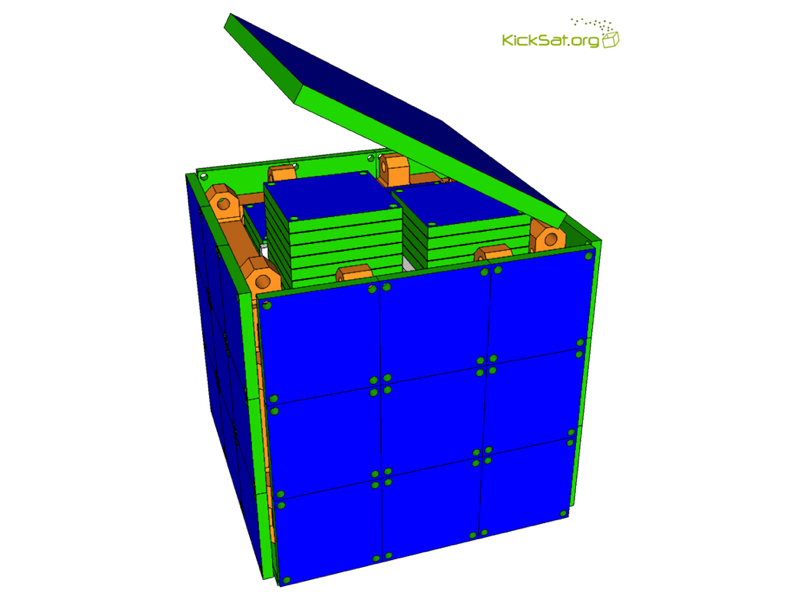 KickSat is a CubeSat – a standardized small satellite that we can easily launch. 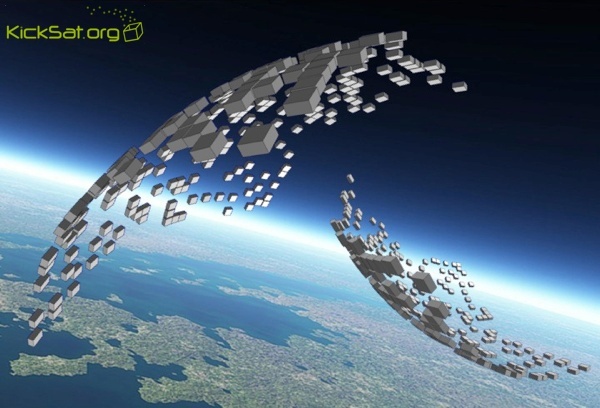 It is designed to carry hundreds or even thousands of Sprites into space and deploy them in low Earth orbit. The Sprites will be housed inside KickSat in several spring-loaded stacks and held in place by a lid. A radio signal transmitted from our ground station will command the lid to open, releasing the Sprites as free-flying spacecraft. After the Sprites are deployed from KickSat, we will track them and record their radio signals using a worldwide network of amateur ground stations to demonstrate their communication capabilities. We will also gather data on how long the Sprites stay in orbit and how well their electronics hold up in the harsh space environment. Because we will only launch KickSat into a low-altitude orbit, we can guarantee that all of the Sprites will re-enter the Earth’s atmosphere within a few days or weeks, leaving no trace of space debris. KickSat itself will last somewhat longer, but should burn up in the atmosphere within a few months. Every donation counts! Anyone who makes a pledge of any amount will have their name listed on our website as a backer, while anyone pledging at least $25 will get their name printed on one of KickSats panels, and anyone pledging at least $75 will get their own replica (non-functioning) Sprite as a souvenir. With a donation of $300 or more, you will be sponsoring the launch of a single Sprite which you can call your own. You’ll be able to name it and specify the short message (for example, your initials) that it will transmit. You’ll also be able to see its position updated on KickSat.org as it flies over a network of amateur ground stations. For a donation of $1000 or more, you can request a Sprite development kit, including a fully functioning Sprite with all schematics, source code, and programming tools so that you can write your own flight code. You’ll also receive a step-by-step guide explaining how to receive and deconvolve the radio signals from the spacecraft if you want to set up your own ground station in addition to using the KickSat.org mission control website. Donate $5000 or more and you can have a personal VIP tour of Mission Control in Ithaca. I’ll show you how KickSat and the Sprites were built, and you can be present when The Big Red Button is pressed to deploy the Sprites. Want to press The Big Red Button? There can be only one, so the first person who donates $10,000 or more gets to press it! Are you a member of a club, society, or group of friends who would like to deploy a fleet of Sprites into space together from KickSat? You can have your group’s logo on all the Sprites in your fleet (souvenirs and flight units) and we’ll list your names together with your logo on the backers page of our website. To sponsor a Sprite as part of a fleet, simply make a pledge at the $300 level or higher, then send an email to fleet@kicksat.org with your name, donation amount, and which fleet you want to join. Let’s kick-start the personal space age! I look forward to welcoming you to this very select group of space pioneers! If you have a question about KickSat or the Sprite spacecraft, please post it in the comments section and I’ll get back to you with an answer. What better way of showing off your uber-geek credentials than having your own spacecraft? This could be the perfect holiday gift along with one of the best wooden watches this year for the geek who has everything or the child who dreams of exploring space. You can make that dream a reality!